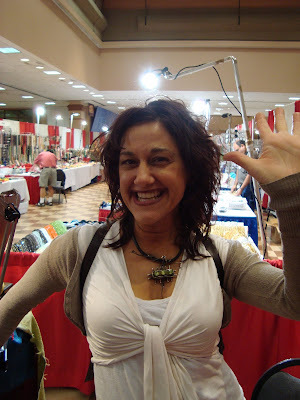 Have you ever used sterling silver curly-Q tubes in your jewelry designs? Lisa is searching for cool ideas for these adorable tubes. Cindy unveils a new series of Art Nouveau inspired beads. In French it's known as "Stile Floreal" and in English, it's the "Floral Style." Melanie shows off some fun experiments that she has seen coming out of her studio, mixing copper and pewter. Looking ahead to the fall, Cyndi shows how to make a new necklace called, "Autumn Arbor". Katie's mixing metals and a fun peyote bail with a giant crystal disk. Beadfest Philadelphia was packed with talented artisans and bead-makers! See what Andrew picked out! Did you know that it is now easier than ever to get ahold of Melanie Brooks of Earthenwood Studio's delicious ceramic pieces? Yep, that's right! 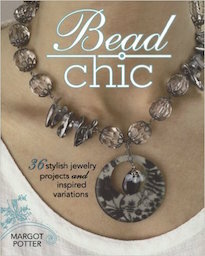 The lovely folks at FusionBeads are now carrying her work. CLICK HERE to check it out. Most rainy days aren't that fun for me. It seems like whenever it rains my eyelids get heavy and I can barely stay conscious. But this particular rainy day was an exception and lots was done. We started off the day touring the local wineries. We started with Walnut Hill Winery. It was pouring rain, but the fine folks at the winery ran out with umbrellas to greet us. What a cute place! I love the little boutique in the front of the winery with all kinds of wine-related goodies. Vidal blanc with a zippy grapefruit flavor was a highlight. After the Walnut Hill Winery, we headed up the road to Raspberry Acres Winery. What a beautiful building and wonderful people! It was such a pleasure talking with Sally. I loved hearing her stories and of course... tasting her wines! My favorite was the "Cat" Country Gold! Once we finished up wine shopping, we needed some lunch. According to Sue of SueBeads, I had to try Clem's Wood-Fired BBQ. I am a smitten kitten with their pulled pork subs. They were so flavorful and the pork was absolutely tender! It was perfect with Boylan's creme soda. After the delicious pulled pork subs, we headed over to the Cheese House. 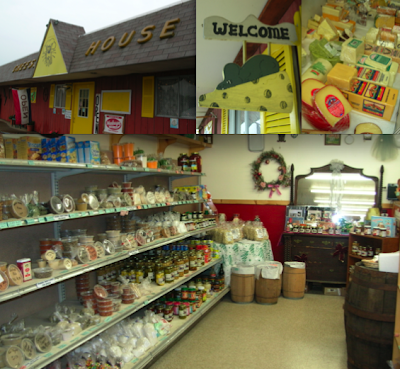 They had a great selection of cheeses, spices, candies, and crackers. They even had a kiosk from Raspberry Acres Wineries with all the award-winning wines. We had a great time talking with the owner and sampling all the different kinds of cheeses. Trying our luck, we headed over to the Armagh Fire Hall for their Friday night Bingo! It was quite an experience. All of us were Bingo virgins and didn't know the routines, special cards, drawings... etc., but soon caught on. I didn't win anything myself, but members of our crew did. After a day of wineries, I probably wasn't on the top of my game, but had a good time trying to keep up. B-I-N-G-O! Today we headed into the city and went around Pittsburgh. I've always wanted to explore the Mattress Factory. When I was in college in New York, they always talked about how it was such a unique museum that focused solely on installation art. Above and to the left is a shot of the main building of the Mattress Factory Art Museum. The center image is a detail from the installation by Renee Piechocki. On the far right is a snapshot of Yayoi Kusama's Infinity Dots Mirrored Room. Here are another few images from the collections of the Mattress Factory. To the left is a detail of Patricia Villalobos Echeverria's piece that is both on the outside and the inside of the secondary building. Also in the second building is a piece by Andrew Ellis Johnson. The image in the center of the roomful of cast marble. To the far right is an image of the gardens outside of the main building by Winifred Lutz. At first look, the yard looked like an empty lot, but upon closer examination, a complex garden unfolded. It was really interesting to see the excavation and explore the different levels. One of the things that I noticed about a lot of the art is that it requires one's presence. I know that's the definition of installation art, but the art I saw was very much based in the moment, the tie between the audience and the work and how they interacted and related. After The Mattress Factory, we walked across the park and headed over to the National Aviary to see some birds. There was a really great penguin exhibit, with sections you could climb in and see the penguins close-up. I had an awesome time exploring the different geographically based rooms, like the rain forest and the Asian and African rooms. Outside they had a presentation with different birds called, Flight Zone. The highlight of the show is when the owl flew overhead and landed on a branch not far from my head! I LOVE OWLS! Above are another sampling of birds found in the aviary. I didn't have time to write down any of the names. Anyone know which ones they are? After a day in Pittsburgh, we headed over to Johnstown to explore the Inclined Plane (apparently it's the steepest in the world) and have dinner at the top of the hill. Above is a shot of Johnstown from the top of the hill. The Inclined Plane connects downtown Johnstown with Westmont. In the center is a view of the rail on the Incline. When the floods came through the valley in the 30's and the 70's, apparently the inclined plane saved many lives. To the far right is a shot of the Relax-a-lator in the ticket and gift shop at the top of the hill. I popped a dime in and gave it a whirl! Boy did it vibrate! My calves are still tingling! Above is a shot Johnstown at night from the top of the hill. The food at the City View was tasty and the views were just to die for. I have found that I am not very good at "vacation." I'm always trying to slip a project in here or there or coming up with a new idea. The limited access to internet and beautiful views has helped in cutting down my worker-horse mentality. Just down the road from Nanty Glo is the Eliza Furnace off of the Ghost Town Trail. It's one of the few in the Blacklicks Valley that still remains and is topped with the original crown of metal heat exchangers. 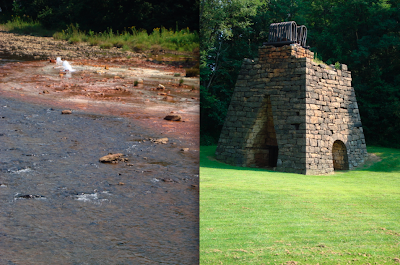 Next to the old iron furnace is a creek with small sulfur geysers. It was interesting to see the bright yellow and rusty orange waters mix with the bright blue-green spring waters. Apparently the bright red color comes from old coal mine acid drainage. As always, I had fun taking pictures of the local flora and bugs. Above are just a small sampling of the pictures I took of the indigence life. I'm curious if anyone knows what kind of flowers are in the photos above and what kind of caterpillar is pictured above as well? After the trip to the Eliza Furnace, which is one of the best preserved iron furnaces from that time period, we made our way to the Yellow Creek State park and walked around the lake. It was peaceful and relaxing to listen to the birds, bugs, and beavers working away. Above is another shot of the lake, sporting patches of water-lilies and tall grasses. I'm pretty worn out from the day's adventures. This is definitely a beautiful part of the country! Here's what I picked up at the show. I didn't really get a chance to walk around very much, but I'm really pleased with the goodies that I found. I adore all of the makers of these beautiful objects. They are all extremely talented! The above Botanical blossom is from Lisa Kan. CLICK HERE to read the story about them and what inspired the making of these delicate and colorful blooms. Lisa also showed me a quick bracelet she put together with her botanicals and a strand of fairy ribbon and it looked fabulous! Saki Silver has been making some phenomenal toggles and links in bronze and shibuichi. I love the warm rich tones and the fact that they are friendlier on the wallet! 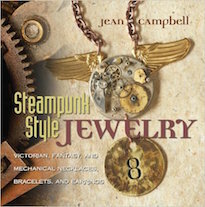 They go perfectly with my family at Green Girl Studios' shibuichi components and bronze coins. Check out the full line of shibuichi HERE and the full line of bronze HERE. Above are three separate purchases from three different vendors. The first purchase was made from Priscilla Marban. These beads are made from sawdust. I love that her natural line of beads help support the Filipino economy and utilizes sustainable resources. CLICK HERE to see her new line bright, graphic sawdust, decoupage, and coconut beads. The center lampwork piece is done by the very talented colorist lampwork artist, Patti Cahill. I adore her beads. They are simply eye-candy! CLICK HERE to check out her Etsy site. On the far right are Maureen of Pumpkin Hill Beads' earthy lampwork glass beads and shibuichi pieces that she carries from LeaAnne Hartman. Bronwen Heilman of GhostCow has been making some pretty cool things. The stands of beads and the loose green bead in the center are all made from liqueur bottles. The blue ones are from a Skyy vodka bottle, the clear ones are from a tequilla bottle, the gold and clear ones are from a vodka bottle and Myer's rum bottle, and the green one is from a wine bottle with micro shards of steel from the device she uses to crush the bottles. The others are her astounding painted and silver-dotted beads. Aren't they just incredibly juicy? The rose-gold anodized niobium earwires are from Marti Brown of The Odyssey and Bead Expressions. 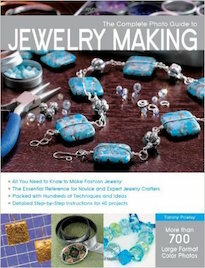 They are perfect for making earrings with. In the center are some really awesome vintage sequins from the ever so versatile and ever-creative Gail Crosman Moore. She's getting ready for hand surgery, so let's all send her positive vibes and well wishes! She's really a darling! Make sure to check out HER BLOG. The two beads on the far right are ones that actually came in the mail before I left for Philadelphia. They are from the ever so talented Lucinda Storms. The one is a bird and the other is a "bloody beautiful" heart. CLICK HERE to read the story behind the creation of the heart. The last bunch of beads I picked up were from the delightful Kelley Wenzel of Kelley's Beads on Etsy. She and Lorelei popped in throughout the weekend to chat behind the booth and show me what each of them found at the show. I had a great time with them, Kelley's lampwork glass beads, and the bowl of Mississippi Mud Pie that Kelley brought up with her ALL the way from Atlanta. Today is the first day of my vacation. It's hard not to try and work on projects. I think that's one of the down-sides of being in a creative field and being self-employed. The mental gears are constantly turning and it's hard to stop and relax – especially when you love what you do! Above is a shot of the scenery from a walk taken today. The vistas here in Pennsylvania are breath-taking. I had fun walking through the woods and looking for various types of fungi. Above are a couple varieties I spotted on the walk. Driving by, I spotted an entire field full of geese. The above picture is only a sampling of the gaggle of geese, at least fifty strong. Another great spot on the walk through the woods was an old spring well. There's even a spoon left on cool stones. The cold metal of its handle gave me a glimpse at thirsty wanderers, stopping for a sip. So far... things are great! I've been enjoying the peace and quiet. It was a great weekend and I'm really happy that I could make my way out to Philadelphia for the show. I had a lot of fun seeing all of our customers, fellow vendors, all of the wonderful goodies that the other vendors made, and the Interweave staff. It was delightful to see Susan Lenart Kazmer. Many of her students stopped by the booth with their projects they worked on in class and they were awesome! (I saw an especially great ring that was set with a giant chunk of pyrite.) Susan has a great online store and a cool design team blog with lots of interesting projects, product uses, and creative content? Lisa Kan was also at the show. She refused to let me take a picture of her, but said that I could take as many pictures of her work as I wanted. So, above is a picture of her new Botanical series. I love the vibrant colors and delicate petals! It was my pleasure as always to see the LillyPilly crew. I love them and their pieces. I have so many of their laser-engraved shells, vegetable ivory, and wooden components! Another really great surprise was seeing Cathy Collison of Glass Garden Beads. I love her bottle cap beads and all of the Foundry objects she has. Seeing Gail Crosman Moore was also a great treat! I love her embellished felt, borosilicate glass, and her beautiful new metal clay pieces. OH! I also really dig her selection of vintage sequins. They're GREAT! 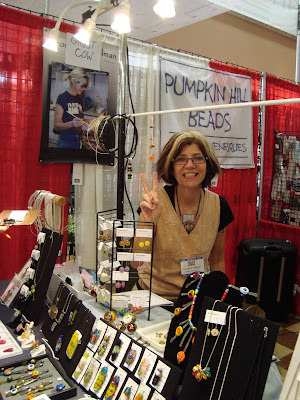 I missed the Ghostcow show out in Prescott, but I was lucky enough to see Bronwen in Philadelphia and her booth-mate, Maureen of Pumpkin Hill Beads. I really like Bronwen's new beads made from bottles. Both Bronwen and Maureen make some really awesome lampwork beads. The weekend was full of surprises! Lorelei Eurto and Kelly of Kelly's Beads dropped by! It was so good to see Lorelei in person after corresponding for so many months. We've been blogging buddies for such a long time! It was also really great to meet Kelly, who is another blogging buddy. She was so thoughtful and brought a bowlful of Mississippi Mud Pie all the way from Atlanta! Such Southern hospitality! What makes the bead shows special for me is the community that surrounds the craft. I love the people and what they bring to their artistry. I'll share the treasures that I picked up tomorrow. 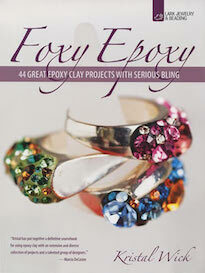 Creating a "tiara" for your wrist is easy using Jill MacKay beading components and bicone crystals. 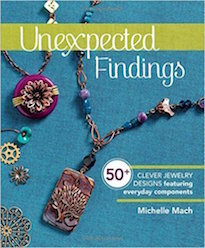 Check out my beautifully organized list of mixed-media book reviews and find the perfect book to help you mix up your jewelry making. Art Bead Scene gets green findings at the local re-use store. Carmi has a short demo on how she came up with a contest entry. What do bronze and rawhide have in common? Cindy explains how she uses both in her studio. Melanie contemplates taking risks, making changes and creative experimentation to prevent art burnout. Jean's whipped up a free vintage button brooch project for you to try. Cyndi wants to know: What's the best thing you've made so far this summer? 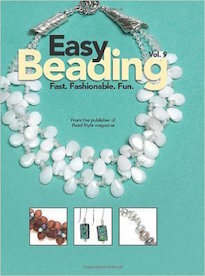 Katie's project is a free, featured download on Beading Daily. Yay! 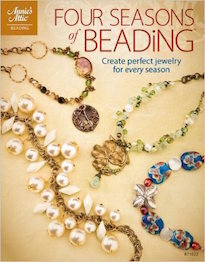 Take a peek into Lorelei's studio and see some cool bead storage solutions! Melissa reveals her Use the Muse II Entry, "Briar Rose." 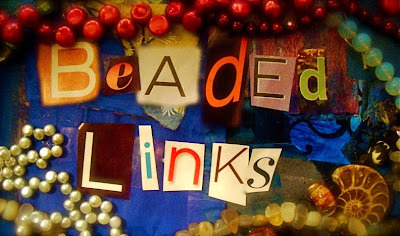 Come join the fun in Philadelphia this weekend at BeadFest! Stop by the Green Girl Studios booth to say hello to Andrew and check out all the great new things available! I have been unpacking and organizing like crazy since I've been back. There are MOUNTAINS of bits, baubles, and beads. Stowed away, many of them were forgotten. Tomorrow I leave for Philadelphia for BeadFest. I am, as always, completely unprepared. Every horizontal surface in the apartment is covered with odds and ends still waiting to be sorted and I've still got to pack for the show and for a week of exploring Pennsylvania. I kind of want to check out the old Westmoreland Glass Company factory. It'll probably just be an abandoned building now, but I do love urban ruins. While unpacking from my last trip, I found Stella. No, not the beer – a special Tonner Wicked Witch of the West doll who my sister repainted. Isn't she lovely? I know I said I'd never get a doll, but Cynthia has slowly been luring me into the doll world by having me make jewelry for her dolls. When I saw this particular doll at Anne Choi's house for sale, I knew she had to come home with me. I think it's a conspiracy! It was perfectly eye-level with me AND I do like the Wicked Witch of the West! Anne Choi and Cynthia were probably in cahoots planning my corruption. 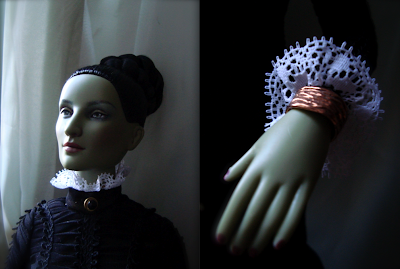 But I can just write it all off as me needing a model for doll-scale jewelry – like the copper clay cuff Stella is sporting in the above picture. For dinner tonight I made steaks with sauteed mushrooms and onions. With the drippings from the pan (and a little extra butter), I made a reduction sauce. This was perfect with the roasted root vegetable side dish. I'm always trying to sneak fresh vegetables into my diet, so I added some uncooked chopped carrots to the roasted beets, sweet potatoes, sweet onions, and garlic. It added a nice crunch to the side dish and accentuated all the vibrant colors on the plate. I was clearing out my bookshelf when I pulled out, Genesis and Geology: The Impact of Scientific Discoveries Upon Religious Beliefs in the Decades Before Darwin by Charles Coulston Gillispie. I originally found the book in a box of books about racism, genetics, geology, and revolutions on the sidewalk several years ago. It was intended for collage material, but in my attempts to streamline my studio became destined for the FREE box to return it from whence it came. I pulled the book out and was about to deposit it in the giveaway box when out slipped a letter. At first I thought it was a piece of junk mail that I scribbled on and was on the verge of tossing it, when I looked a little closer. It was an unopened envelope from Falls Church Florist for Barbara Howard. It was dated February 28th, 1966. Apparently the letter was intended to be forwarded to Barbara at her Mount Holyoke College address. A thought popped into my head – return the unopened letter to Barbara Howard. The only other clues to help me on my quest come from the book itself: two inscriptions in faint pencil. The first is the name, "Barbara Guinn Howard" on the inside cover and the second is the sentence, "Purchased at the Holyoke Bookstore, February 4th 1966 for $1.75." So, here is the challenge: Find Barbara Howard and return the unopened letter! I am drawn to ruined things, rusty parts and pieces, and frayed edges. I am perhaps enchanted by these objects and places in various states of decay as much as I am taken in by traditionally beautiful things. Maybe even more sometimes. Perhaps it's the ghost of them that call to me? Or that in their fading and falling apart, quiet stories are told. Industrial things no longer needed, wanted, loved... they are evidence, artifacts, remembrances and my imagination is a medium that unlocks the untold tales. Today I went for a walk. I started out at the park. Children were playing, people were crowded on park benches, families were laughing – all of them were enjoying the summer outside in a lovely place overlooking the City. But my mind sought solitude away from the hundreds. So I walked towards the river. Thirty years ago, twenty years ago, fifteen years ago – even ten... walking towards the river was not a safe thing to do. The Wilds of Brooklyn, were truly that. The stories I've heard would chill the most sturdy of stock. But these places are forgotten now, even to those who would wish to remain in the shadows. 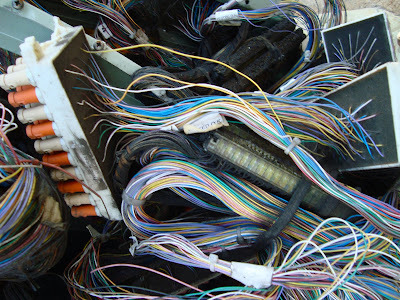 Now the cables and wires lay twisted and exposed, opened to the elements. The buildings are now abandoned and there is no need for them or their purposes. All the lines are silent. Windows lay, littered, on the ground in sparkling, shifting, mosaics. Barbed wire, once meant to keep people out, has long rusted and fallen and only guards against the careless. But even in the ruined places, flanked by chain link fence and crumbling foundations, life persists. Wild blackberries with their own barbed defenses grow. Sweet, tart berries are left to rot. No one is there to pick them or to be pricked – not even the cunning house sparrows. Even still, there are traces left. Pieces of torn dresses can be found like fallen flags, hinting at horrible misdeeds. The solitude of ruined places is not a completely quiet one, but one filled with echoes, shadows of ghosts and the things that remain and have not yet yielded – that have not been swallowed up by the earth. 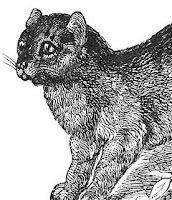 Happiness is like a stray cat – if you feed it, it'll stick around and stay with you forever. If you ignore it, it is likely to move on to a different house. 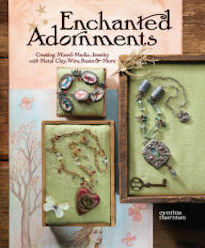 Looking to create a pendant from one of her antique button treasures, Cindy tries her hand at mold-making. Melanie shares her new Shino glaze tests and ponders about her new work. The simple spiral square stitch can add pizazz to your projects. Learn this easy stitch with an easy to follow tutorial! Jean helped deliver two babies this week: a new nephew and a new bracelet design. Art Bead Scene announces the August monthly challenge theme - a beautiful Japanese woodcut print. These seemingly innocent boxes have been sitting in my studio for awhile now. (They are only half of the boxes I have to go through. The rest are stacked up in the other corner.) In them are mountains of beads, vintage jewelry, art supplies, and random oddities that need sorting, shifting, and distributing. Some of it I'll keep. Some of it I'll give away... and some of it I think I'll sell off in the tradition of the "yard sale" I had back in December. 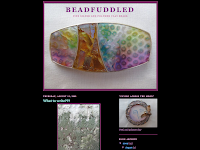 Did you know that Kelly Russell of Beadfuddled has a blog? It's a great place to check on what she's working on, get a behind-the-scenes look at her processes and keep abreast of all the latest news. CLICK HERE to swing by. I had the delightful pleasure of popping by Elizabeth Castaldo's place for the Creative Social Club this evening. What fun! It has been years since I've seen Elizabeth and it was amazing to catch up with her. I had the distinct honor of taking a peek at her new pieces and her work on some new postcards. Her work is phenomenal! I love the intricate line work and attention to subtle detail. I also adore her handmade books. They are absolutely perfect. CLICK HERE to check out her Etsy shop and look over her collection of bound goodies! Today the BIG REVEAL was announced for Scarlett Lanson's Use the Muse II challenge. The piece below is the one I created for the contest. I had a lot of fun making it. (I wasn't sure that I'd be able to participate or not this time around since I've been on the road so much lately, but was lucky to find a few moments here and there to pull a piece together.) I call it, "Ocean's Bride." I developed a story that went along with the piece about a sea nymph who stole a pearl and was punished. But in her punishment she found redemption through beauty and empowerment through forgiveness. Her freedom and happiness were hand-crafted and originated from herself. I adapted a Wandering Needle technique, used textured metal clay chain, and utilized wire-wrapped link chain with this piece. I also used a toggle from my family at Green Girl Studios. I think the Lillypilly focal embellished with smaller Swarovski pearls makes a perfect frame for the big blue pearl. Make sure to check out the winners from the contest and see all of the other participants' phenomenal work. (Scarlett's split the contestants into two groups, so keep an eye out for both sections.) Also don't forget to join the fun and enter the third installment of the Use the Muse Contest by CLICKING HERE.